This nice beachhouse is for long or short term for rent. We work with work together with a local realestate agent. The caretake is a very friendly young man and respect your privacy and take care of the garden, pool and the house. You wil be safe in Cumbuco the tourist police Ronda is located in the center and keeps an eye on the house. 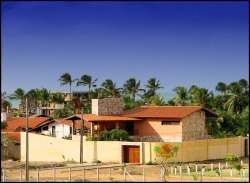 Casa Kariri has 4 suites on the first floor and have an own bathroom with shower and toilet. 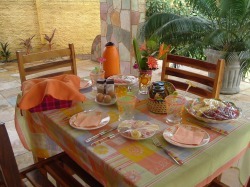 From the room you can go to your private balcony from wich you can see the ocean and the pool and tropical garden. Aerconditioning is no needed the whole year there is a nice seabreeze and the whole house has venetian wooden windows. The supermarket in the village or the breakfast store will bring you all the things you needed in the morning or evenening you can ask the caretaker to do it for you or you can just give a call to one of the suppliers in the village .